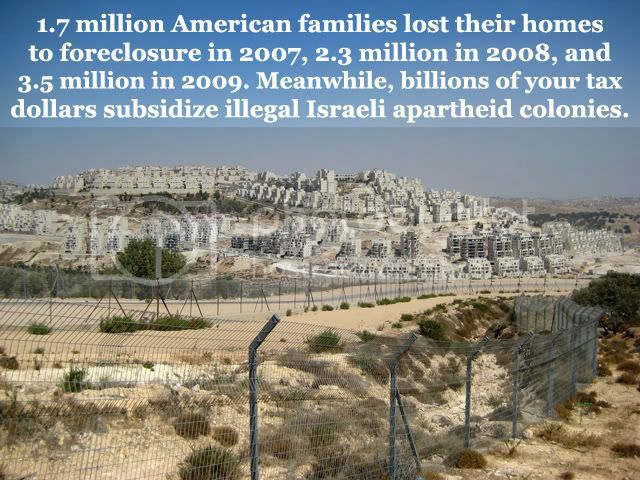 Apartheid-colony "israel" builds racist sewers on stolen Palestinian land, and US taxpayers pay for it. I watched this lengthy movie, looking to laugh at khazar the hutt, and I did, yet it was also incredibly boring at times, and hearing them say anti-semite like tourette's, especially from jabbe's bloated tongue, makes one want to go into a psychotic rage; therefore the movie has been edited down to just over 20 minutes, enjoy! On 8 January 2009, ‘Ala, 15, his brother, Ali, 16, and their cousin Hussein, 13, were released from the cold wet pit in the ground where they’d been detained by Israeli forces for two days and two nights, bound, blindfolded and semi-naked. These children had been used as human shields, a practice which constitutes a war crime and may amount to a crime against humanity. Upon their release, they were ordered to walk, under heavy fire, to Jabalia in the north of Gaza. ‘Ala and Ali’s older brother, Nafiz, 17, who had also been held in the hole, was transported to Israel and detained for eight more days. Al Mezan interviewed Hussein, ‘Ala and Ali (now 14, 16 and 17 respectively) a year after their ordeal. The boys, along with other civilians from their north Gaza neighbourhood of Al-Atatra had been detained on the morning of 5 January 2009, after Israeli forces stormed the house they were sheltering in. Before being taken to the pit that night, the boys were stripped to their underwear, blindfolded, tied in a human chain and marched around their neighbourhood to check civilian homes for booby traps or fighters. On 8 January, ‘Ala, Hussein and Ali were released and ordered to go to Jabalia. Nafez, along with several other boys and men, was transferred to a detention facility in Israel where he was held for a further eight days. Ali explained the journey, “It was difficult to walk because of all the destruction. The planes kept shooting near our legs. We only made it about a kilometre before deciding to go back to the hole. We didn’t understand where the Israelis wanted us to go and we thought we were going to be killed.” When they got back to the hole they were told to take another route, and eventually made it to Jabalia. “I won’t go again,” Hussein declares. “It was too scary last time and you have to walk a long way on foot. My legs hurt the whole way because I was so scared.” Nevertheless, at just 14, Hussein has put his trust in the Israeli judicial system. “I want the officers to know what the soldiers did to us; how they tortured us and kicked us. I expect they’ll go to jail now that they know.” Ali smiles and shrugs, his cynicism perhaps not misplaced. Despite the documentation of serious international humanitarian violations by a United Nations Fact Finding Mission, not a single Israeli soldier has been charged with a war crime a full year after Operation Cast Lead. According to the documentation of Al Mezan, the UN and international NGOs, during Operation Cast Lead, Israeli forces damaged or destroyed 15 out of 27 hospitals in Gaza and attacked three UN premises being used as shelters for the displaced, including with white phosphorous. British lawmaker George Galloway says he has been manhandled by Egyptian intelligence officers before being deported from country on Friday. Upon his arrival to London, Galloway told Press TV that Egypt took revenge on him due to its disdain for aid convoys which expose the Israeli-imposed blockade on the Gaza Strip. "I am sorry to say that Egypt is implicated in this siege. That's the reason of their revenge on me." "They [Egyptians] hate these convoys because they expose a siege that Egypt denies," He added. Galloway, one of the organizers of Viva Palestina aid convoy was deported from Egypt after protests and clashes erupted on the Egypt-Gaza border. The clashes erupted after Egyptian authorizes refused some of the vehicles access to the strip. They later detained Galloway and put him on a plane to London, said a spokeswoman for the convoy. Despite restrictions imposed by the authorities, the convoy of around 200 vehicles managed to break the Israeli siege on Gaza on Wednesday. Galloway, however, said the restrictions would not prevent him from organizing more aid convoys to break the three-year-long siege on Gaza. Cairo has deported British lawmaker George Galloway, following clashes between a Gaza-bound aid convoy he was accompanying and Egyptian police. The lawmaker was planning to return to Gaza via the Rafah crossing early Friday when several Egyptian plainclothes security forces detained him and bundled him into a plane and flew him to London. A spokeswoman for the convoy said police intervened when Galloway and colleague Ron McKay arrived at the crossing. "As soon as they emerged on to Egyptian soil, both men were forcibly pushed into a van, refused exit and told that they were leaving the country. They were then driven off in a police convoy," the BBC quoted him as saying. There are no comments from the Egyptian government on the deportation. On Tuesday, Egyptian police harshly confronted a protest by Viva Palestina activists in the port of El-Arish, leaving some 60 people injured and arresting a number of them. The scuffle followed Cairo's refusal to allow aid vehicles to enter the Palestinian Gaza Strip — which has been under a paralyzing Israeli blockade since 2007 — making the convoy take a big detour and delaying its arrival. Despite restrictions imposed by Egyptian authorities, the convoy finally managed to deliver nearly 200 aid trucks to Gaza after a month-long journey. Galloway, the Bow and Bethnal Green lawmaker, and his team of international activists have sent three relief convoys into the Palestinian territory. Israel's move to keep border crossings with Gaza sealed off is further reinvigorated by Egypt's refusal to open the Rafah crossing, the only border terminal not in Tel Aviv's control. Furthermore, Cairo has recently started building a steel wall on its border with the Gaza Strip to disrupt a network of cross-border tunnels, through which the Palestinians have been pushing in food, fuel and other essential necessities. The United Nations Relief and Works Agency Commissioner-General, Karen Abu Zaid, has described the wall as more dangerous than the Bar Lev Line built by Israel along the eastern coast of the Suez Canal after it captured the Sinai Peninsula from Egypt during the 1967 six-day war. Gaza - Ma'an - israeli warplanes carried out a series of raids on sites throughout the Gaza Strip late Thursday night, witnesses said and Israel's military confirmed. Three citizens were killed and two others injured in the Israeli raids that targeted a tunnel near Rafah crossing south of Gaza. Medical sources in Abu Yousif An-Najjar hospital identified the dead as Barakat Abu Shalouf, Odai Abu Heesh, 15, and Naser Al-Mahmum, 22. Muawiya Hassanein, the Gaza Health Ministry's director of ambulance and emergency services said the jets struck four areas in total. Early reports from Al-Jazeera said a missile killed one Palestinian and injured two inside a smuggling tunnel along the Gaza-Egypt border. Locals reported to Ma'an that smoke was rising above the tunnel area just after midnight. At least two missiles landed in the southern Gaza Strip city of Khan Younis, one of them near a school, and a third between Khan Younis and Rafah. Jets were still flying overhead the area early into Friday morning. Two missiles struck what was described as a military target in the Gaza City neighborhood of Zaytoun. Residents said a missile hit the center of the nearby An-Nuseirat Refugee Camp. According to an Israeli military spokeswoman, the targets included a weapons manufacturing facility in Gaza City and three tunnels, two along the Egyptian border and another near the border with Israel in central Gaza. She said the third tunnel was intended to facilitate attacks on Israel. The official said the airstrikes, among the most wide-scale attacks since Israel's devastating assault last winter, came in retaliation for the 10 mortar shells reportedly launched toward southern Israel on Thursday. The military wing of the Popular Resistance Committees said a total of 14 mortar shells were launched in three rounds on Thursday. The military spokeswoman told Ma'an Israel "will not tolerate the firing of rockets by terror organizations at Israel and will continue to respond against attempts to disrupt the calm in Israel's southern communities." The three mortar barrages were the largest attack on southern Israel since the end of its Operation Cast Lead, which left some 1,400 Palestinians dead. Projectiles have been intermittently launched at Israeli targets in clusters of two to four, with no more than two barrages in a single day. The PRC said the first launch of two launches included eight, and the second an additional four mortars. After the first two launches, Israeli forces dropped hundreds of thousands of leaflets into areas in northern and eastern Gaza (pictured above), warning Gazans to stay away from the border area. Shortly after the third attack, Palestinians in Jabaliya reported hearing explosions, although no evidence of Israeli artillery fire or airstrikes was reported. One of the projectiles landed near the Kerem Shalom crossing, prompting its closure. The leaflets, which residents said were dropped in northern and southern Gaza, warned Palestinians not to approach within 300 meters of the Israeli border, and against digging tunnels into Egypt. One reported that the "prohibited zone" includes border areas in Beit Lahiya, Beit Hanoun, and Jabaliya in the north, Khan Younis, Khuza’a, and Abasan in the center, and Rafah in the south. A second warned Palestinians against using tunnels to circumvent the Israeli blockade of the territory. "Terrorists, tunnel owners, and the smugglers of military equipment know for certain that the continuation of terrorist attacks, the smuggling of military equipment, and the digging of tunnels will be targeted by the IDF [Israel Defense Forces], but they continue to work in your residential areas and seek refuge among you," according to the flier, which was written in Arabic. "The digging [of] tunnels under your houses and the smuggling of military equipment into Gaza constitutes a threat to your lives, the lives of your children, and family, and your property," it added. "Do not stay idle and let the terrorists use you. They will not stand beside you when harm is done to you and your property. ... Take responsibility for your future." The leaflet also lists an email address and a phone number urging Palestinians to provide information about smugglers and tunnel operators. A military spokesman confirmed that the leaflets were dropped from air force planes, warning that anyone who comes within 300 meters of the border is "putting themselves at risk," warning against weapons smuggling. The spokesman said "the IDF will operate against anyone who harbors terrorists." Following the first wave of mortar attacks, Israel announced that the Kerem Shalom crossing point was closed after sources said a mortar shell fired from Gaza landed in the area. Palestinian officials said between 86 and 96 trucks had been scheduled to deliver aid to Gaza. Israel shut down its borders with Gaza after the elected Hamas government took full control of the territory in June 2007. The closure has reduced imports of vital goods to one-fifth of pre-blockade levels and prevented the Strip's 1.5 million residents from leaving. Israeli helicopter gunships have also been flying over the West Bank town of Tulkarem. At least two people have been killed in a fresh round of Israeli airstrikes on the Gaza Strip, recent reports say. The airstrikes, which were launched in the early hours of Friday, hit seven targets near Gaza's border with Egypt. Medics say several people have been left wounded or missing in the incident, a Press TV correspondent reported. The war-game is said to be aimed at recognizing and the mistakes of Israel's 22-day offensive on Gaza last year, which led to the deaths of over 1,400 Palestinians and cost Tel Aviv severe criticism at home and abroad. Tel Aviv is conducting war games in the Negev desert, in what appears to be preparation for a new offensive on the Hamas-run Gaza Strip. It further revealed that Tel Aviv plans to occupy the entire coastal enclave this time to compensate for the failure to overthrow Hamas, the democratically elected ruler of the Gaza Strip. The Israeli army is said to be practicing to forestall the mistakes which led to the deaths of several of its soldiers during the last offensive, the poor handling of which cost Tel Aviv severe criticism at home and forced senior army officials to resign. The report added that Israeli tanks have been equipped with a new system able to identify friendly units operating in the battlefield — even when they are among civilians. The 22-day Israeli offensive last year saw weeks of relentless air, land and sea incursions against the Palestinians in Gaza. It left more than 1,400 people, including hundreds of women and children, dead. It also devastated a large part of the infrastructure in the impoverished coastal sliver which has been under an Israeli blockade since 2007. Israel has recently stepped up saber-rattling against the Palestinians in Gaza, with Israeli planes dropping thousands of leaflets across Gaza in December, urging Gazans against cooperating with the resistance fighters based in the region, and threatening a new attack. The Viva Palestina aid convoy finally entered Gaza on Wednesday, after it received the approval of Egyptian authorities to bring several tons of humanitarian supplies into Gaza Strip. One month, thousands of miles, ten countries, one ship and a four flights later, Viva Palestina has begun to enter the besieged Gaza Strip. "We are all emotional to see that all of Gaza are out to greet us! Our Viva Palestina convoy is symbolic! It shows the Palestianian people just how much the people of the West do care.
" We come in peace to deliver humanitarian aid and we hope that our convoy (and convoy's like ours) will help to build pressure on the Israeli government to break the siege." Click here to read an example of one email sent this evening - feel free to use/amend, etc. Britain's prime minister, Gordon Brown, marked the start of the New Year in a way that many campaigners for justice and liberty will find lamentable. The charity MAP (Medical Aid for Palestinians) had written an open letter to Brown asking him to "urgently use all available diplomatic means to bring an immediate and unconditional end to the blockade of the Gaza Strip". It reminded Brown that a year after the assault on Gaza, in which almost 1,400 Palestinians were killed and more than 5,300 injured, civilians continued to pay a devastating price. "Across the Gaza Strip, over 3,530 homes were completely destroyed and more than 2,850 severely damaged. Tens of thousands more homes suffered structural damage." A recent MAP survey of the most vulnerable families shows that only 2% have been able to repair their homes from damage inflicted in last winter's bombardment. Families now face the winter in tents or in the rubble of their destroyed homes. And that’s not all. A public health disaster is looming: with no spare parts for maintenance or repair, water and sewage treatment facilities cannot function. “The World Health Organisation reports that over 80% of Gaza's water is no longer safe to drink, while up to 80 million cubic litres of untreated or partially treated sewage is being dumped into the sea daily." The letter also reminded Mr Brown that the British Government had said Israel's blockade must end, and emphasized the need for fine words to be backed up by meaningful diplomatic action. It was signed by nearly 4,000 people. And what was Mr Brown's response? “Your open letter to me of 27 December in The Observer was right to draw attention to the grave humanitarian situation in Gaza, one year after a conflict that cost over a thousand Palestinian lives and those of over ten Israelis. “As I have made clear repeatedly to the Israeli government, it is unacceptable that Israel continues to prevent aid from reaching those who so badly need it in Gaza. EU Foreign Ministers reinforced our call for full humanitarian access earlier this month. “Alongside diplomatic pressure, I pledge that the UK will remain in the forefront of the humanitarian effort. Following the offensive a year ago, we spent £20 million on humanitarian aid for the people of Gaza. “And on 28 December, Douglas Alexander announced a total package of £53.5 million for Palestine, with a particular focus on Gaza - including £5 million of new funding for the United Nations’ work with Gazan refugees. “While Hamas’ actions can be no justification for preventing aid reaching the people of Gaza, Hamas must remove the menace of rocket attacks against the people of southern Israel, and release Gilad Shalit. “Ultimately, we can only give the people of Gaza real hope when genuine negotiations bring a lasting and just peace settlement. The parameters of such a potential agreement are clear. In the coming year, we must pursue still more vigorously a comprehensive peace based on secure and viable states of Israel and Palestine. For all of our futures, those who oppose justice and peace for the peoples of the region must not be allowed to prevail. He hasn’t budged an inch and just gets siller. Britain spent £20 million on humanitarian aid for the people of Gaza last year? Where and when? Can any of it be accounted for? “I pledge that the UK will remain in the forefront of the humanitarian effort,” says Mr Brown. No, Viva Palestina are at the forefront while Brown and the other loafers twiddle their thumbs. And what has the release of the Israeli soldier Gilad Shalit got to do with this? Why isn’t Mr Brown evenhanded enough to call for the release of 11,000 Palestinians who are rotting in Israeli jails? Doesn’t he know that Israel's troops continue to abduct Palestinians on a daily basis? And hasn’t it dawned on Brown yet that you can make something clear to the Israelis till you’re blue in the face but they’ll take no notice unless you’re prepared to act? As for “negotiations”, is international law suddenly negotiable? Are UN resolutions negotiable? Is “real hope” only available from Britain at some distant future point in time when non-existent negotiations have brought a lasting and just peace settlement? What gobbledygook is that? Humanitarian action is needed now – today – and surely must leapfrog interminable, bogus peace processes. If the parameters of a peace settlement are so "clear", why don’t the British government and the other western powers stop dithering and implement them? For decades our scheming, conniving western leaders have failed to deliver one jot or tittle of justice to the Holy Land. Instead, they have allowed the enormity of Israel’s crimes to escalate, for which the lawless entity continues to be admired and rewarded in the higher echelons of British government to the point where certain ministers plan to change our laws to protect wanted war criminals and let them walk free on the street of our capital city. And have you looked at the map recently, Mr Brown? What is clear to most people is that your “comprehensive peace based on secure and viable states of Israel and Palestine" is now impossible, especially for Palestine, without forceful action by the international community. While Brown was penning his reply to MAP, the Gaza Freedom Marchers were composing their excellent Cairo Declaration calling for an end to Israeli apartheid. In it they point to our own governments having given Israel direct economic, financial, military and diplomatic support and allowing it to behave with impunity. They point to the contempt for Palestinian democracy shown by Israel, the US, Canada, the EU and others after the Palestinian elections of 2006. They point to the war crimes committed by Israel during the invasion of Gaza a year ago and make no bones about the need to end the charitable status enjoyed by the Jewish National Fund (JNF), of which Brown is unwisely a patron. So let's hear it, Mr Brown. Let’s hear the S-word... SANCTIONS. After all, you're not afraid to deploy sanctions against poor beat-up Palestinians, and against Iraqis, and against Iranians - none of whom have ever posed a threat to Britain. So you shouldn’t flinch from using sanctions against the thugs for whom last year’s killing spree wasn’t enough and who now threaten a second Gaza onslaught. - Stuart Littlewood is author of the book Radio Free Palestine, which tells the plight of the Palestinians under occupation. He contributed this article to PalestineChronicle.com. Contact him at: www.radiofreepalestine.co.uk. Just days into Israel's war on Gaza, in early January, the extended Al Samouni family, some 48 men, women and children, was attacked in the homes they occupied together in the south of Gaza - and almost all of them were killed. Thirteen-year-old Almaza - 'jewel' - is one of the very few who survived the attack in which 30 members of her family died, many before her own eyes. A Girl Called Jewel is Almaza's story, a heart-breaking eye-witness account of the war in Gaza. I am Almaza Ibraheem Helmi Mahmoud Samouni. I'm in the seventh grade. I am thirteen years old. In the future, when I become a politician, I can work on children's rights for those who have been deprived of their families, and were brought up as orphans. Every minute, I remember my family. Every minute I remember when they were martyred in front of my eyes. I looked at my nephew, I saw that he was martyred. Also, I looked the other way, I saw all my family martyred. They were dead, lying together, one on top of the other. Really, it was a scene I couldn't believe. All my family is gone at once. Thirty of my tribe were killed. It is completely unjust. Now, when Eid comes, I won't see my uncles. On the day of Eid, I used to visit my uncles, go to uncle Talal's home... go to Rashad's home and go to Atia's home. What have I done to be deprived of my family, to be deprived of my uncles and my mother? Allah is great, Allah is great! Allah is great, Allah is great! Witness there is no God but Allah. I witness that Mohammed is the messenger of Allah. Come to pray, come for success. Praying is in progress. Allah is great, Allah is great! There is no God but Allah. I was at home. We were unaware of anything. In the early morning about 6AM, the israelis started invading. First, they invaded with planes, and when they knew the area was safe for them, the tanks and bulldozers followed after. About four o'clock at night, there were suddenly shells and bullets coming inside our house. We went into the living room. We were very close to my uncle Talal's house. There's only a narrow pathway between us. They started firing shells that made a very loud noise and gave off a strong smell. Eventually we couldn't hear or breathe, we were suffocating. We were about to die and then suddenly the israelis blew a hole in the wall and pointed their weapons at us. The look of them frightened me of course. If they're coming at night, how would you know who they were? You could not even see their shadow. They kicked us out of the house and sent us to Wael Samouni's house. We stayed there for three days without food, without water. Even the little children who wanted to drink - and some were about six months old - there was not even anything for them. We stayed there for three days. My brother went to get some wood, but when he was about to leave the house, they fired a missile at him and he was martyred. So, we had to go inside. I was left with my sister-in-law and her nine month old baby. They executed the baby. They opened fire on him. The little boy was martyred in front of her eyes, while he was in his mother's arms, cradled by his mother. He was executed right after they executed his father. I went inside where I found them all martyred. I saw three missiles in the house. All of them were martyred. All of them were bleeding and they were in a pile, one on top of the other. A lot of bleeding...bleeding over each other. We used to study here. We used to play here. This was my brother's room, here's my mother's room... and here are my siblings' room who were all martyred. May Allah bless their souls. This is where my books were, and I used to put my satchel here. I have alot of memories. This was mine when I was little. This was my mother's, may Allah bless her soul. This belonged to my brother Nassar, may Allah bless his soul. This is mine, I used to wear it when I went to the mosque. This is also mine. And this was my nephew Mo'tasem's, may Allah bless his soul. This is my mother's robe, may Allah bless her soul. This is my brother Ismail's, he was martyred. Here is my uncle's house. We used to bake here. Here we used to play "idreas" with stones. Here is the mosque. Here we used to learn the Quran, pray and have lessons in Quran verses. Here, of course, was the praying place for men, and the upstairs there was a floor for the women. Here you can see the maryrs (poster). There is my brother Mohammad Ibraheem Samouni, and that is my cousin Walid. Here is the dome of the mosque, where a crow used to stand. The dome was so high. This is the dome. We used to study here. Our teacher used to sit over here. It was a sitting room with the breeze blowing through. We used to come to study here and learn the Quran. Here, we used to have our meetings, bring the chairs and sit. The sheikh would sit here. This was a room where we used to sit and study. Here we used to raise a lot of chickens. A lot. The israelis bulldozed it and killed them all. This is the school. The destroyed school. 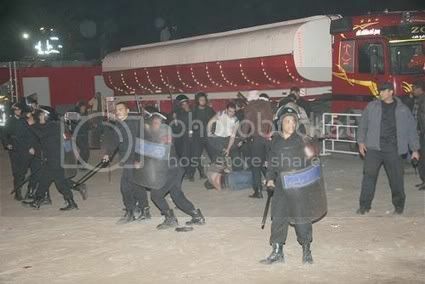 They targetted the school with burning phosphorus bombs. They burned the school. The lab that we used to go to, it was also burned. We had drawn a map. Even that was destroyed, as you can see. They didn't leave anything untouched. This was the lab I used to go to an do everything. It was bombed as well. Here was the library where we used to borrow storybooks and sit and write. They've all been destroyed too. We used to go to a morning school, then this was switched to the afternoon. Now there are about sixty orphans, maybe more, they are all orphans. What have they done? A girl of two and a half who's now an orphan. Who will play with her, who's going to teach her? Her mother, father and elder brothers are all martyrs. Can a girl who's twelve or thirteen years old raise an eighteen month or two year old girl? No, because she doesn't ask or respond. When my mother was martyred, she was in her arms. We asked her: "Do you want to go to see your mother?" She said: "No, because mum is dead, she was shot by the plane. I don't want to go to her." There was so much bleeding from here and here (points to her face and neck). I don't want to go there. She refused because when my mother was martyred, she was in her arms and with my father. When they were putting the bandage on my father when he was injured, she wouldn't ask about her or about anything else. She just keeps on screaming. We will never leave our place here. We will remain in it and Allah, please God, may make it easy for us, to help us rebuild our homes and live in them, insha'ALLAH. Minnesota resident Ryan Olander is facing deportation after being held in Israeli prisons for over two weeks. He spent his Christmas and New Year at a deportation facility in Ramle, where his request for release has been rejected by the prison judge. His lawyer submitted an appeal to the District Court in Tel Aviv on 27 December 2009 challenging the request of the Israeli Ministry of Interior for Mr. Olander’s deportation. The lawyer is anticipating the decision of the judge within the next 48 hours. Ryan Olander was arrested from a tent the Palestinian al-Kurd family built in their own backyard following a recent setter take-over of a section of their house. He was drinking tea and talking to the family members when six Israeli police walked into the tent and took him for questioning at the Russian Compound police station in west Jerusalem. Despite being released without charges the following day, Ryan was illegally re-arrested by immigration police only a few moments later, right outside of the same police station that told him he was free to go. "I have become a target of the police for standing in solidarity with the Palestinians of Sheikh Jarrah who struggle against the unjust and illegal evictions from the places they have called their homes for nearly 60 years. Now I face deportation from Israel." the Ftyaney family house left the Palestinians with two broken windows and fear of future attacks. Christmas celebration in Sheikh Jarrah included spray-painting 'Death to Arabs’ in Hebrew, throwing fruit at Palestinians sitting in front of occupied al-Kurd house, violently pushing Palestinian residents and international activists, spray-painting one in her face. Sabbah family, breaking into their house and injuring seven family members. Two of the injured were cut with a knife and a pregnant woman, who was kicked in her stomach, had to be taken to hospital. Another family member was hit in the face and had a gun pointed at her. 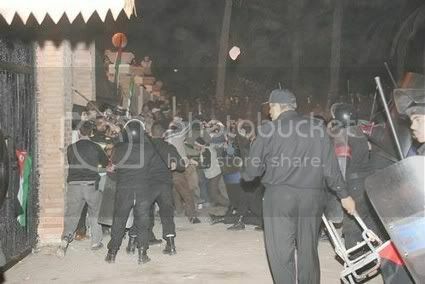 - 26 December 2009: A group of settlers attacked Palestinians from the neighbourhood with stones. Three children and one adult were injured as result, and a French man who took pictures of the episode was violently attacked by a settler. hospitalised with respiratory problems after being attacked by a settler in her own garden. Approximately 475 Palestinian residents living in the Karm Al-Ja’ouni neighborhood of Sheikh Jarrah, located directly north of the Old City, face imminent eviction from their homes in the manner of the Hannoun and Gawi families, and the al-Kurd family before them. All 28 families are refugees from 1948, mostly from West Jerusalem and Haifa, whose houses in Sheikh Jarrah were built and given to them through a joint project between the United Nations Relief and Works Agency (UNRWA) and the Jordanian government in 1956. So far, settlers took over houses of four Palestinian families, displacing around 60 residents, including 20 children. At present, settlers occupy all these houses and the whole area is patrolled by armed private security 24 hours a day. The evicted Palestinian families, some of whom have been left without suitable alternative accommodation since August, continue to protest against the unlawful eviction from the sidewalk across the street from their homes, facing regular violent attacks from the settlers and harassment from the police. The Gawi family, for example, had their only shelter, a small tent built near their house, destroyed by the police and all their belongings stolen five times. In addition, the al-Kurd family has been forced to live in an extremely difficult situation, sharing the entrance gate and the backyard of their house with extremist settlers, who occupied a part of the al-Kurd home in December 2009. The settlers subject the Palestinian family to regular violent attacks and harassment, making their life a living hell. The ultimate goal of the settler organizations is to evict all Palestinians from the area and turn it into a new Jewish settlement and to create a Jewish continuum that will effectively cut off the Old City form the northern Palestinian neighborhoods. On 28 August 2008, Nahalat Shimon International filed a plan to build a series of five and six-story apartment blocks – Town Plan Scheme (TPS) 12705 – in the Jerusalem Local Planning Commission. If TPS 12705 comes to pass, the existing Palestinian houses in this key area would be demolished, about 500 Palestinians would be evicted, and 200 new settler units would be built for a new settlement: Shimon HaTzadik. Implanting new Jewish settlements in East Jerusalem and the West Bank is illegal under many international laws, including Article 49 of the Fourth Geneva Convention. The plight of the Gawi, al-Kurd and the Hannoun families is just a small part of Israel’s ongoing campaign of ethnic cleansing of the Palestinian people from East Jerusalem. Bethlehem – Ma’an – A British-led aid convoy bound for the Gaza Strip is on its way to the Egyptian port of Al-Arish after departing Syria by boat, organizers said on Sunday. The Viva Palestina convoy, led in part by firebrand British MP George Galloway, loaded 210 truckloads of food and medical supplies onto a ferry in the Syrian port of Latakia. The group, which set out from London nearly a month ago and drove through Turkey and Syria, spent five days stranded in Jordan after Egypt denied it permission to travel to the Red Sea port of Nuweiba, insisting that aid convoys should transit through the port of Al-Arish, on the Mediterranean. The convoy had originally planned to enter Gaza on 27 December, the one-year anniversary of Israel’s war on the Gaza Strip which left more than 1,400 Palestinians and 13 Israelis dead. In a message released on an affiliated website on Sunday, Viva Palestina’s organizers said they received verbal assurances from Egypt that they would be allowed to dock in Al-Arish on Monday. Another group, the Gaza Freedom March, also faced opposition from Egyptian authorities with a plan to bring 1,300 international demonstrators to the Strip for a march against the Israeli-led blockade. Fewer than 100 from the group were allowed into Gaza, the rest stranded in Cairo. 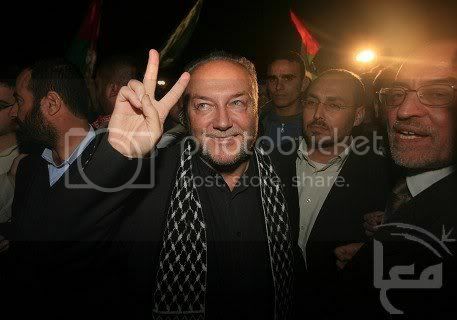 Galloway led two other successful convoys to Gaza in 2009. Israel has maintained a siege of Gaza since June 2007 when the elected Hamas government took full control of the territory, shutting down security forces loyal to rival group Fatah. So we are asking our friends and supporters to dig deep in their pockets and make an emergency donation towards the costs now facing the convoy including chartering the ULUSOY-6 to tansport the vehicles and four plane trips to move the convoy members. With your help we will once more deliver aid to the people of Gaza - and once more demand the end to this inhuman siege. Thank you to the many supporters from more than twenty countries who have already donated online. Your generousity and support is wonderful. The British premier's office says that Prime Minister Gordon Brown and US President Barack Obama have agreed to fight what they call terrorism in Yemen and Somalia. The UK and the US have agreed to fund a counter-terrorism police unit in Yemen to tackle the rising threat from the country. The UK and the US have agreed to fund a counter-terrorism police unit in Yemen to tackle what they deem the rising threat from the country. The US has been involved in war in Yemen by sending its special forces to train the Yemeni military and conducting air raids in both northern and southern parts of the Middle Eastern country. On December 18, ABC News quoted anonymous administration officials as saying that US Nobel Peace Prize laureate President Barack Obama ordered the US military to launch air strikes on Yemen. Upon the orders of Obama, the military warplanes on December 17 blanketed two camps in the North of the Yemeni capital, Sana'a, claiming there were "an imminent attack against a US asset was being planned." The attacks killed scores of civilians, according to Yemeni opposition groups. US military intervention in Yemen comes at a time that the country's army with full support from Saudi Arabia has been fighting with Shia Houthi fighters in northern parts of the country. Houthi fighters say both Saudi and US fighter jets have been involved in bombing Shia villages, inflicting heavy civilian casualties. Earlier, the fighters had expressed full readiness for dialogue with the Yemeni government. The Houthis say they will turn to talks if the Yemeni and Saudi military halt their attacks against them. The conflict in northern Yemen began in 2004 between Sana'a and Houthi fighters. Relative peace had returned to the region for a period before August 11, when the Yemeni army launched a major offensive, dubbed Operation Scorched Earth, against Sa'ada Province. The government claims that the fighters, who are named after their leader Abdul Malik al-Houthi, seek to restore the Shia imamate system, which was overthrown in a 1962 military coup. The Houthis, however, say they are defending their people's civil rights, which the government has undermined under pressure from Saudi-backed Wahhabi extremists. Shias, who form the clear majority in the north, make up approximately half of Yemen's overall population. The United Nations, which according to its charter is set up "to take effective collective measures for the prevention and removal of threats to peace, and for the suppression of acts of aggression or other breaches of the peace," has failed to adopt any concrete measures to help end the bloody war. The latest alleged front against al-Qaeda in Yemen is opened more than eight years after the US-led invasion of Afghanistan which was said to be aimed at eradicating militancy and the arrest of main militant leaders including Osama Bin Laden. According to UN figures, Afghan civilians have been the main victims of the controversial war. For weeks the defining image of Israel’s military siege of the Gaza Strip was a distant haze of smoke rising from the ground, sanitised footage that told nothing of the horrors of war. But in the late afternoon of January 16, Dr Izzeldin Abuelaish broke through the silence imposed by the Israeli government’s news blockade and for a few minutes the raw, unfathomable grief of a father whose three daughters and niece had been killed minutes before rang out to the world. “My God, my God can’t anyone help us please,” the prominent Palestinian doctor said in a telephone interview with Israel’s Channel 10 station as he pleaded for an ambulance and an end to the shelling of his house. Almost one year later Dr Abuelaish, 54, was reflective about the tragedy that symbolised the anguish of all Gazans during the 22-day offensive and earned him the nomination for the Nobel peace prize. “It was a lesson, a message from God,” he said, speaking from his office in Toronto, where he has since moved with his surviving family. Dr Abuelaish, a widower, moved to Toronto last July with his two sons and three daughters to take up a position as associate professor of global health at the University of Toronto, one of the most prestigious institutions in North America. His tranquil new life in the Canadian city is as far from Gaza as is possible to imagine. The doctor teaches graduate students, carries out research work on public health issues and in the evenings spends time with his children, whom he calls “my life, my everything”. But he has not forgotten Gaza. In his spare time Dr Abuelaish has written a book about his experiences which is expected to be published next month by Random House. He also speaks to high school students and to Muslim and Jewish community centres, preaching a message of compassion and peace, its poignancy heightened by the fact that it is delivered by a man who watched the Israel Defence Forces kill his children. “We must listen to each other, we must understand each other and use the right weapon, and I fully believe that words are stronger than hundreds of weapons. This is the new course we have to adopt,” he said. Dr Abuelaish, born in the Jabalia refugee camp in Gaza, studied medicine at Cairo University in Egypt and earned a Master’s degree from Harvard University in America. He specialises in obstetrics-gynaecology and many of the texts he studied at home were written by Israeli doctors which is how he learnt Hebrew. He was one of the few Gazans with a permit that allowed him to work in Israel and he travelled back and forth to the Chaim Sheba Medical Center in Tel Hashomer, just outside Tel Aviv, where he treated Arab and Israeli patients and did research work on fertility. When Operation Cast Lead began on December 27, 2008 he was at home in Jabalia with his eight children. His wife had died in September after a long battle with leukaemia. There was no question of leaving the five-storey house which was known by everyone in the neighbourhood as belonging to the doctor. He said all his neighbours had fled but there was nowhere safe for civilians. The Israeli forces were hitting schools, hospitals and mosques in their offensive against Hamas. Very little news was emerging from the scene of the fighting because Israel banned reporters from entering the territory. Dr Abuelaish was giving telephone interviews in Hebrew to Channel 10 news about the impact on Palestinian civilians. At 4.45pm he was scheduled to speak to Shlomi Eldar, one of the station’s correspondents, and had left his daughters Mayar, 15, and Aya, 13, in their bedroom on the third floor. Seconds after he walked out of the room it was struck by a shell. Both girls were killed instantly. Bessan, 20, his eldest child ran to see what happened and a second shell hit the room. She was also killed. Their cousin, Nur, 17, also died. “They were playing, they were speaking together and planning their future,” said Dr Abuelaish. Minutes later, he was on the phone with Mr Eldar, crying and begging for an ambulance. The visibly upset presenter promised to help and through his contacts got the army to stop firing at the doctor’s house and allow a Palestinian ambulance through. A fourth daughter Shatha, now 18, was badly injured by shrapnel. Dr Abuelaish said he believed God saved his life for a greater purpose. The shells came just as he was due to speak to the journalist at a time when most Israelis were home for the Friday Shabbat dinner. That afternoon as he lay crying he looked to his son Mohammed, then aged 13. Shortly before the military offensive began, the University of Toronto offered him a job, but he had been reluctant to take it because he did not want to leave Gaza. Israel declared a unilateral ceasefire the following day, on January 17, and soon after Dr Abuelaish decided to take the teaching position. The Israeli army initially claimed snipers were firing from the doctor’s home and militants were inside the building. An investigation earlier this year found that the IDF fired accidentally on his house. The military said it was “saddened” by the harm it caused but under the circumstances the decision to fire shells on the building was “reasonable”. “They said there were militants in my apartment. There were militants, my daughters were militants and they were armed with hope, love and education,” said Dr Abuelaish. His surviving children are thriving in their new school including Shatha, who has recovered and is studying civil engineering in university and Mohammed, who is in high school. In memory of Aya, Bessan and Mayar the doctor launched the Daughters For Life foundation which will raise funds to educate poor Palestinian girls and provide them with health care. Dr Abuelaish was nominated in April for the Nobel peace prize but lost to the American president, Barack Obama. He plans to return to Gaza for good after his five-year work permit expires. The territory is in ruins. The sea is poisoned by millions of gallons of raw sewage because water treatment plants are broken. The land is a rubble of stones and cement. Only 41 lorries of construction material have been allowed through since January. Gaza is becoming disconnected from the world as farms lay in waste and businesses shut down. The population is mostly young, traumatised and angry. The burden of responsibility to help Gaza is greater than ever for the doctor. Iranian President Mahmoud Ahmadinejad has expressed hope that justice and peace will be established across the world in the New Year 2010. "The year 2010 will turn into the year of peace and prosperity for the human community in the light of spirituality, morality and justice," said President Ahmadinejad in a New Year message to the heads of Christian states. He added that Jesus was a divine miracle and the prophet of compassion and the herald of human prosperity. "Without a doubt the path and the teachings of the prophets are the path for mankind's prosperity, perfection, establishing justice, peace and lasting friendship," said the president. "The root of all social, moral, political problems as well as the economic recession in the world lies in straying from this path and teachings." He wished for the coming of the awaited messiah of world nations and Jesus Christ, who all prophets have foretold. Ahmadinejad expressed hope that the new year would be one filled with calm, prosperity and the promotion of human dignity. GAZA, (PIC)-- Dr. Naim Baroud, a Palestinian professor of geography, warned that the building of the steel wall would cause environmental and health disasters for both the Palestinian people in the Gaza Strip and the Egyptian people in Sinai. In a press statement published Friday by Palestine newspaper, Dr. Baroud noted that Egypt’s underground aquifer in Sinai is shared with Gaza and fed by rainwater which flow from south to north and vice versa to feed all this inter-aquifer, adding that the steel wall would affect the flow of water into this basin. The professor also said that Egypt’s intention to pump large amounts of very salty water, which is unfit for human use and contains pollutants, from the Mediterranean sea into the Palestinian-Egyptian borders will change the chemical properties of the inter-aquifer and turn its sweet water into highly saline water. He warned if this happens, the Egyptian and Palestinian citizens in the area of this aquifer will be no longer able to use water wells. The professor stressed that the danger of this steel wall are not confined to the contamination of groundwater, but also it will affect the soil, where the iron pipes planted in the ground and the drilling rigs that operate on a daily basis will lead to the disintegration of this soil, which is already loose, and to landslides in the areas surrounding the wall. The professor also touched on other ecological impacts of this wall and criticized Egypt for not conducting environmental, hydrological and economical studies to determine the hazards of this wall. As for the ability of Gaza people to find alternative solutions to the problem of the steel wall, the professor expressed his optimism that Gazans could invent creative ways to beat and resist this wall. In a related context, Palestinian minister of interior Fathi Hammad stated Friday that any concrete or steel walls would not deter the Palestinian people in Gaza from obtaining freedom. During a cultural meeting held in Gaza, Hammad noted that the Gaza people would be able to penetrate all walls. Saudi scholar Youssef Al-Ahmed, a professor at the university of Imam Mohamed Ibn Saud in Riyadh, issued a fatwa (religious edict) forbidding the construction of Egypt’s steel wall. The fatwa, which was posted Friday on Noor Al-Islam network website, says that this wall is religiously prohibited and one of the greatest sins in Islam. For his part, Hamas spokesman Sami Abu Zuhri, said, during a ceremony held Friday to honor families of martyrs in the neighborhood of Al-Daraj, east of Gaza city, that the Gaza people, who remained steadfast in the Israeli war, will never fail to beat any walls besieging them. The attacks were reminiscent of Israel's three-week-long onslaught on the Gaza Strip, which was launched in late December 2008 and continued into the New Year. Over 1,000 Palestinian citizens of Israel and several dozen Jewish Israelis demonstrated this morning outside of the Erez Crossing, demanding an end to the Israeli blockade of the Gaza Strip. Organised by the Arab High Monitoring Committee, the demonstration coincided with the one year anniversary of Israel’s military attacks on the Gaza Strip, which resulted in 1,400 deaths and thousands wounded. “”The Israeli war against the Palestinians of Gaza continues one year later,” said Knesset Member Jamal Zahalka (Balad) at the protest. “We demand an immediate end to the Israeli siege, and that the Israeli criminal leaders who implement this dirty war be brought before international tribunals before they start another war,” he added. A demonstration on the Gaza side of the border was conducted simultaneously, joined by over 80 delegates from Gaza Freedom March. The protest on the Israeli side was attended by grassroots Palestinian activists from throughout Israel, with particularly large delegations from the Naqab (Negev), Jaffa and the Galilee area. A busload of activists from the Sheikh Jarrah neighborhood of Jerusalem, which has suffered from Israeli ethnic cleansing activity attended the demonstration, in addition to three buses of international and Israeli activists from Jerusalem organized by the Alternative Information Center (AIC), also attended the demonstration. GAZA CITY, occupied Gaza Strip (IPS) - For many survivors of the last Israeli war on Gaza, time has not healed their wounds, physical or emotional. Halil Amal Samouni, 10, still suffers vision problems in her right eye. The shrapnel remaining in her head causes her constant pain and she is unable to concentrate at school. Her concentration is broken, also, by memories of her martyred father and younger brother, both of whom she saw shot dead at close range by Israeli soldiers during the 2008-2009 winter war on Gaza. The name Samouni has become well known for the high number of martyrs in the extended family, and for the brutality with which many victims were killed, the Israeli army's prevention of medical access to the injured, and the thorough and systematic destruction of homes, farms, and civilian infrastructure in the Zeitoun district in eastern Gaza, and all throughout Gaza. In the wake of Israeli tanks, bulldozers, warplanes and Apache helicopters, the once tree-laden area was left a muddy pitch of rutted earth and tree stumps. Chicken farms were destroyed, along with plastic greenhouses, farm equipment, water piping, and the tens of homes, agricultural buildings and the local mosque. Many of the remaining houses were taken as military positions, sniper holes bored through walls, soldiers' excrement, clothing, spent ammunition and food provisions were routinely left among the trashed belongings of the house. Hate graffiti was found throughout homes in the Samouni neighborhood and all over Gaza. Most horrifying was the targeted shooting of the family -- including children -- and the deliberate shelling of homes they had been forced into by Israeli soldiers. Amal Samouni was among the least fortunate of survivors. When Israeli soldiers came to her home early on 4 January, they shot her father Atiyeh dead at close range, then fired continuously into the room full of family members. Amal's younger brother Ahmed, 4, was seriously injured by the shooting. Denied medical care, he died the following morning, roughly ten hours after Israeli soldiers prevented medical rescuers from entering the area. "They killed my dad and my brother. They destroyed our house," Amal says simply. She has told her story to journalists many times. "But it hasn't done any good, nothing has changed." Zeinat Samouni, Amal's widowed mother, shows the single room her family of eight are crammed into, cracked asbestos tiling covering the roof. "The roof leaks. We put plastic jugs on the floor to catch the water," she says. "And because we can't buy cooking gas, we cook over a fire instead." Aside from their physical discomfort, it is memories of the massacre and fear of a new attack that trouble them. "I was terrified he would choke," she says, gesturing to a child she holds. "He was only a few weeks old at the time." She recounts the trauma of having another child die in her arms, seeing him shelved in an overcrowded mortuary freezer, and all the while desperately wondering whether Amal was still alive. "Even now, I'm still so afraid for my children, afraid that another war will come. The UAVs (unmanned drones) are always over us, and often at night the helicopters come." In northern Gaza's Ezbet Beit Hanoun, families and friends of the Abd al-Dayem and Abu Jerrad families gather on 26 December, holding a candlelight vigil in remembrance of their sons, wives and husbands killed during a series of Israeli flechette (dart-bomb) attacks a year back. The first to be killed in that area of Gaza by the razor-sharp nails was medic Arafa Abd al-Dayem, 35, on the morning of 4 January. Along with other medics, Abd al-Dayem had been on duty in the Attatra region, in Gaza's north, retrieving wounded and martyred. As the medics loaded the ambulance, Israeli soldiers fired a flechette shell at the clearly marked vehicle, spreading thousands of darts at high velocity. Abd al-Dayem died an agonizing death, his internal organs and lungs shredded by the darts. Khalid Abu Saada, a medic and the driver of the ambulance, testified to the Palestinian Centre for Human Rights: "The shell directly hit the ambulance and 10 civilians, including the two paramedics, were injured." The following morning, the Abd al-Dayem family and friends gathered at a funeral tent erected for Arafa. Israeli tanks again fired flechette shells, striking the gathering multiple times, killing five at the tent, one down the road, and injuring at least 25. "The pain is still fresh, I still can't move on since my sons' murders," said Sabbah Abd al-Dayem, mother of two martyrs in their twenties. Jamal Abd al-Dayem, father of the young men, recalls: "It was clearly a mourning house, on the road, open and visible. Immediately after the first strike, the Israelis fired again. I lost two sons. One of them was newly married, his wife eight months pregnant." Said Abd al-Dayem, 29, died of dart injuries to his head one day later in hospital. Nafez Abd al-Dayem, 23, died immediately from the darts to his head. Nahez Abd al-Dayem, 25, survived but retains two darts in his abdomen, one in his chest, with only the dart in his leg removed. Islam Abd al-Dayem, 16, a cousin, died after three days in hospital from the darts to his neck. Arafat Abd al-Dayem, 15, a cousin, died instantly. Human rights organizations like Amnesty International, Human Rights Watch, Physicians for Human Rights, and B'Tselem, among others, have criticized Israel's use of flechette bombs in civilian areas in densely populated Gaza, where the darts have a "wide kill radius," and indiscriminately target civilians. Wafa Abu Jerrad, who was 21 and pregnant, lived down the street from the mourning tents. She was with her husband Muhammad, their two children, and relatives outside their house when Israeli soldiers fired the dart bombs. Muhammad Abu Jerrad was stepping into the doorway, their two-year-old son Khalil in his arms, when the bomb hit. Wafa dropped to ground, struck by flechettes in the head, chest and back. She was killed instantly. Sitting outside his family's tent in the Attatra region, Saleh Abu Leila says, "Everything I worked for is gone." Since their two-story home was destroyed by Israeli soldiers during the war on Gaza, Abu Leila and 13 other family members have crowded into two small tents. During the summer, they sweltered in stifling heat. Now that winter is setting in, they are struggling to keep warm and dry. Over 21,000 houses were destroyed or seriously damaged during the 23 days of Israeli attacks throughout Gaza that finally ended 18 January. Since the end of the Israeli war on Gaza, Israeli authorities continue to block entry to cement and other necessary building materials. Glass, along with wood, piping and many other items, is considered potentially dangerous by Israeli authorities. The bomb-blasted windows of homes and buildings remain un-repaired one year later; the luckier families making due with plastic sheeting. A small portion of Gaza's 1.5 million people can afford to buy the overpriced, poor-quality cement smuggled in through the tunnels running between Gaza and Egypt. For those hardest hit, however, this is out of reach. Hundreds of families, like the Attars, still remain in substandard shelters, insufficient for winter cold and rains. Many Gazans do not welcome the New Year, they fear what it will bring. All rights reserved, IPS -- Inter Press Service (2009). Total or partial publication, retransmission or sale forbidden.